If you want more systems, you need another mod to install them. -(in Greek mythology) a fire-breathing female monster with a lion's head, a goat's body, and a serpent's tail. This ship has SIX artillery systems. Zoltans made an extremely complex artillery system for this Federation Cruiser, and only they know how to fully operate it. If it gets damaged, you need to use a nanobot repair bomb to fix it. Both side rooms have an ion blast and a heavy pierce laser. The middle room has two beam weapons. If you aren't a Zoltan, you can only control one of the beams. If you upgrade the artillery system, it only upgrades the second beam which requires a Zoltan to operate. What were those Zoltans thinking when they made this? Artillery charge times based on two power. Charge time is 25% longer with one power. -Beam: 28 second charge, 2 damage, guaranteed breach, pierces 1 shield, 2x damage to systemless rooms, damage increases every 3 shots for a maximum of 4 damage, only hits one room. -Laser: 10 second charge, 2 damage, chance of breach or fire, pierces 1 shield, damage increases every 3 shots for a maximum of 4 damage. -Ion: 6 second charge, 1 ion damage, fire-rate increases .3 seconds per shot for a minimum charge time of 4.5 seconds. Last edited by RAD-82 on Fri Aug 03, 2018 11:06 pm, edited 2 times in total. That room highlight was messed up for the rest of the run once I discovered it. After my run, I couldn't duplicate it. I did win (normal difficulty vanilla with Limited Time Offer for more systems), despite not getting any extra Zoltans to help with the power-hungry artillery. Please continue to make mods! It makes me sad to see this mod community dying. I've been playing FTL since 2013 and am just now getting into modding it. But half of the mods listed on the official page have defunct links :'( If you have any copies of mods I'd appreciate if you could share them with me or post them to dropbox or something similar so others can access them as well. Your work is appreciated! I hope to see this community continue to live on. Download updated to version AE.1.1 for FTL version 1.6.3! FTL 1.6.3 didn't make this ship unplayable, but some things needed to be fixed. -For the interior graphics of the front artillery room, I had to place a fake "room" system. 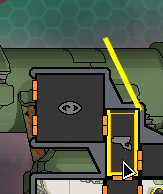 In FTL 1.5.13, the game looked for img/icons/s_room_overlay.png. Luckily, FTL 1.6.3 didn't break this fake "room" system, but it was showing a modified img/nullResource.png (red sign/red background instead of yellow sign/white background) instead of s_room_overlay. I made nullResource a blank image to get rid of it.